Last Updated: 1/30/18 | Reviewed By: Adam H. Rosenblum Esq. possible imprisonment up to 30 days or probation. Criminal record: Driving on a suspended license is classified as a criminal offense in New York. The formal charge is called Aggravated Unlicensed Operation (AUO). There are three levels of AUO in New York. Third- and second-degree AUO are misdemeanors, while first-degree AUO is a felony. A conviction means having a permanent criminal record, which can affect many aspects of a person’s life from employment to housing opportunities, and even immigration status. Jail time: Drivers caught driving while suspended risk a jail sentence upon conviction. Drivers can spend up to 30 days in jail for AUO in the third degree; up to 180 days in jail for AUO in the second degree; and up to four years in jail for AUO in the first degree. Fines: The cost of a conviction for driving on a suspended license in New York depends on the severity of the charge. Third-degree AUO can cost $200 to $500. Second-degree AUO can cost $500 to $1,000. In the most severe cases, first-degree AUO can cost $1,000 to $5,000. Auto insurance premium increase: Driving while suspended in New York can cause insurance premiums to skyrocket. While the exact amount varies, rates can go up by as much as 40 percent. He/she will also be classified as a high-risk driver and very likely could get dropped by the insurer altogether. Found to be operating a motor vehicle with knowledge that their license has been suspended or revoked. Has three or more suspensions imposed on at least three separate dates for failure to appear, answer or pay a fine. Committed the offense while under permanent revocation resulting from three DWI convictions or three refusals to submit to a chemical test (or any combination thereof), as well as from two DWI convictions resulting in serious injury or death. Driving with a suspended license is more than just a traffic ticket—it is a serious criminal offense. In addition to jail time and substantial fines, a conviction can make it difficult to get affordable car insurance for years. It is urgent that any driver facing a charge of driving while suspended hire a qualified NY traffic ticket attorney to reduce the charges, minimize the fines, and avoid both a criminal record and the risk of jail time. Pursuant to the AUO statute, if at the time of getting ticketed the driver held a license from a foreign country, state, territory, or federal district permitting him/her to drive in New York, then he/she cannot be convicted of driving while suspended in New York. However, most drivers do not fall into this limited category. For those with only a New York license, do not lose hope! There is a great defense that good attorneys implement in order to help fight this charge. and as a result could not have been expected to know that the license was suspended. In such a case, a prosecutor will likely say that the driver should have known under the circumstances because a person of normal sensibilities checks their mail regularly and would have found out from the sent letter. Remember, make sure to give all of the facts to a NY traffic ticket attorney and supply him with any documents received regarding the suspension. Doing this will allow him to help construct the best defense possible. Just because you might be guilty in the eyes of the law doesn’t mean a skilled attorney can’t negotiate or argue you out of it. An experienced attorney will know how to negotiate the best outcome possible regardless of the circumstances. The case law in New York regarding driving while suspended license tickets reveals a little-known insight into defeating the AUO charge. In People v. Pacer, 847 NE 2d 1149, the prosecution attempted to introduce an affidavit prepared by an official at the DMV claiming that all of its notice procedures were followed effectively. Additionally, the prosecution admitted that the affidavit was a “sworn document prepared by a government official specifically for use by the prosecution at trial” (see People v. Pacer, 6 N.Y.3d 504). Cleverly, the defense attorney cited a famous Supreme Court case, Crawford v. Washington, to help his client. In Crawford, the Supreme Court ruled that testimonial statements that were not previously subjected to cross-examination are inadmissible against a criminal defendant (see Crawford v. Washington, 541 U.S. 36). The defense attorney used this precedent to argue that the affidavit constituted the paradigmatic piece of evidence that Crawford required to be excluded. Here, the affiant’s sworn statement—that she had information causing her to believe that the Department actually mailed notice of revocation to defendant—was crucial to the People’ case. Faced with evidence of this type, defendants have no means of challenging the People’s proof on a critical element. Without an opportunity to cross-examine the affiant, defendant had no chance to inquire about the basis for the affiant’s “information and belief” that the Department mailed the notice. Defendant had no chance to inquire whether the Department sometimes makes mistakes in mailing revocation notices; whether there were other drivers in the Department’s database with the same name as defendant to whom the Department might have mailed the notice; to what address the affiant believed, based on her information, the Department had mailed the notice; whether the notice might have been returned undelivered; or whether the affiant could testify reliably about procedures as they existed 16 years earlier. In short, the lack of a live witness to confront eliminated defendant’s opportunity to contest a decisive piece of evidence against him. People v. Pacer, 6 N.Y.3d 504, 509. What does all of this mean for a driver charged with AUO? Anyone ticketed with AUO in New York now knows that if any affidavit is being used against the driver by the DMV (or a similar kind of written document), but the author of that document is not willing to come to court to be cross-examined by the defense attorney at trial, New York law requires that the document be excluded from evidence and not used against the driver! This case is a great weapon that any traffic ticket attorney trying AUO cases should use whenever he or she finds it applicable. It is crucial to remember that the prosecution bears the burden of proof even in an driving while suspended case. This means the prosecution must be able to show that you knew or should have known about the suspension. If an attorney can eliminate such evidence based on this precedent, the driver is well on his/her way to a lesser offense or an outright dismissal. For more information about driving with a suspended license check out our Driving While Suspended ebook. New York law enforcement can easily look up a driver’s license to see if it is suspended. But can an officer in New York tell if an out-of-state driver’s license has been suspended? The answer is, usually but not always. Thanks to something called the Driver’s License Compact, police officers in New York State (and other participating states) can look up an out-of-state driver’s license during a traffic stop in New York. 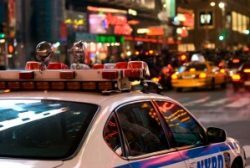 If the out-of-state license has been suspended, then the New York-based officer can issue a ticket for driving while suspended. Out-of-state drivers still face the same fines, sentencing, and criminal charges as a New York driver. In addition, an out-of-state driver who is convicted of driving while suspended in New York can see the charge appear on their driving record, which will also affect their auto insurance rates. Can you go to jail for driving with a suspended license? Yes. The lowest-level charge for driving while suspended in New York can result in up to 30 days in jail. For the highest-level charge, a person could spend as much as four years behind bars. Is it a felony to drive with a suspended license? In most cases, no. But AUO in the first degree is a felony. There are several circumstances that can result in a first-degree AUO charge (see the chart above). If my license is suspended in New York, can I still rent a car in another state during the suspension period? In most cases, no. Any reputable car rental company will deny the rental application if the driver’s license is suspended. Can I get a license in another state if my NY license is suspended? No. Nearly all license applications in the U.S. ask if the applicant has a suspended license from another state. Those who lie and are caught could face even more serious charges. If you give a police a valid out-of-state license will they see your New York suspension? It depends on the circumstances but very likely, yes. 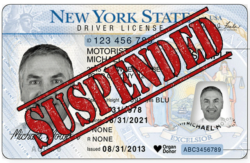 If the out-of-state license is still current and valid, then a suspension in New York is likely to appear on the out-of-state driving record. It’s also possible the out-of-state license will be suspended in response to the New York suspension. Preliminary figures show that New York law enforcement officials in 2017 issued more than 111,000 tickets for Aggravated Unlicensed Operation (AUO), also known as driving while suspended. This is a 4 percent increase over 2016, in which nearly 106,000 such tickets were written. In 2017, the most tickets for driving while suspended were issued in Suffolk County on Long Island, with more than 20,000 written. This is more than twice the next-highest county, Erie, which handed out 9,305. It is nearly impossible to tell if a driver’s license has been suspended until after the officer has had a chance to check it during a traffic stop. Thus, a person is most likely going to be charged with AUO after being pulled over for another infraction such as speeding, cell phone or texting violations, or seat belt violations. Nearly 9% of all companion tickets (those issued in addition to the primary reason for the traffic stop) were for driving while suspended. The facts are clear: driving while suspended is a serious charge and the likelihood of getting caught is very high. A conviction for driving on a suspended license in New York can have a serious long-term impact on one’s life, including the ability to drive, obtain insurance, get a job, and more, in addition to the risk of jail time. I received a ticket for AUO 3rd because my license got suspended for not paying a Driver Assessment Fee. I was unaware that my license was suspended or else I would have simply paid the fee and got the suspension lifted. I was not on a highway, but on main street in Northport. Steven – this violation is classified as a misdemeanor offense. As such, it is not possible to expunge it from your criminal record in NY. I therefore strongly suggest contesting this violation. If you would like to discuss further, please do not hesitate to contact us directly at 888-883-5529. I was recently ticketed for AUO 3rd (511a) and failure to keep right after being involved in an MVA while on private property. The entrance to the property has clear signage stating ‘Private property, no trespassing’. I was on the property legally as I work for an employer on said property. My question is, would proving that the incident occurred on private property be an applicable defense to get the charges dismissed? Per 511(a) I was not operating on a public highway or roadway open to the public. Bradley – if proven true, that is likely a valid defense to AUO in the 3rd degree. I travel all over the world and depending on project, I am not in one state long enough to justify changing license every 6 months on average. I use to live in NY but have not had a NY licence for nearly 30 years. I was in NY visiting 16 years ago and did get a ticket, pleaded not guilty, officer did not show up, judged dismissed, but it evidently showed up as not paid and they said my NY license was suspended for not answering answering ticket. So not having a NY licence, how did this court clerical error go back to NY records when I did not present a NY license as I have not had one for 10 years when I got ticket in NY in 2001 according to officer, and it was dismissed. So I just got a ticket for driving with suspended license due to this supposed unpaid ticket? I verified my license in other state and is valid? One other thing, this ticket was issued in retail parking where they were using scanner on parked cars which I was sitting in. So how is this unlicensed operation when not on public highway or road, but officer put the name of road shopping center is off of? I was not driving on this road so how can a ticket be issued when parked. Mike – irrespective of the underlying legal arguments you may present – it is likely more cost efficient for you to pay any outstanding fines and bring your driving status up to date. I got an AUO in the third last night after being told my license was suspended by two different towns. Of course I was placed under arrest and charged. Here’s the kicker, it was suspended due to unpaid tickets, that I had mailed in not guilty. I have a crazy life, and forgot about them entirely. Not thinking at the time I never received a court date. Nor did I ever receive any notification from DMV. My wife gets are mail everyday, and she has never seen anything from DMV or the towns. So basically I was charged with an AUO even though I honestly had no clue. Basically if I read your article right, for the DMV statement to be submitted, they must have the rep, show in court? If they do not, it cannot be admissible correct? Hi Chris, legal representation is needed for an AUO charge. AUO charges are criminal offenses and could lead with some time in Jail. 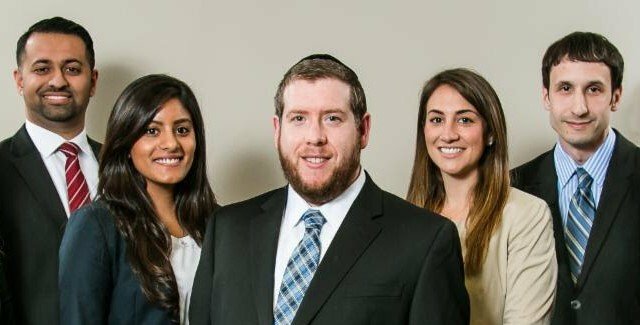 Please contact our office for a free consultation to find out how we would be able to assist you. We could be reached at 888-883-5529.
i was charged last year with aggrevated driving on a suspended license in the 3rd..payed all my fines and went to what i thought was ny dmv and paid 70$ fee to lift suspention..paper i have even says department of motor vehicles on the top..she told me to carry paper with me 2-3months that was march 2015. so january 5th i got pulled over leaving work cause my breaklights stay on constantly he ran my license and it came up suspended..i was so confuse cause i thought i took care of everything..i am now being charged with aggrevated driving on a suspended license in the 2nd..so i found the paper i was to carry with me 2-3 months and took it to dmv find out was was going on..she said that paper was from county clerks office..not dmv..even though it says dmv on the top anyway she said i also owe tickets in another ny town and thats who has the suspension..which i plan on calling mon soon as office opens to take care of fast as possible but my court date is on 28th will i go go jail even though i really did think my license was reinstated? Katie – due to the serious nature of these charges, I suggest you contact us as you had mentioned. This is a very fact specific case, and would like to clarify a few details with you before providing any further advice. My son was sleeping in his vehicle with AC on. Community security officers knocked on his car window. He woke up. The NYPD arrived they ran his license and unbeknowst to him, his license was suspended. He was arrested and charged with a VTL 511. I am very confused. He was not driving his vehicle. He was parked, sleep with AC on. Is that a crime? Sandra – it truly depends on what they are claiming your son has done. Due to the serious nature of this infraction, I suggest you contact us to discuss further. I was given a AUO in the 3rd, I paid the 750 driver responsibility fee and was stated that my license was reinstated. I later learned that I had a 500 fee to pay and that they now found a ticket from 2009 where my license is suspended, and now received a AUO in the 2nd- within a month time frame. What do I do? Connie – due to the serious nature of the charge, I strongly suggest you contact us for a free consultation. I strongly suggest you contact us to discuss your ticket, as the consequences for this violation are severe.